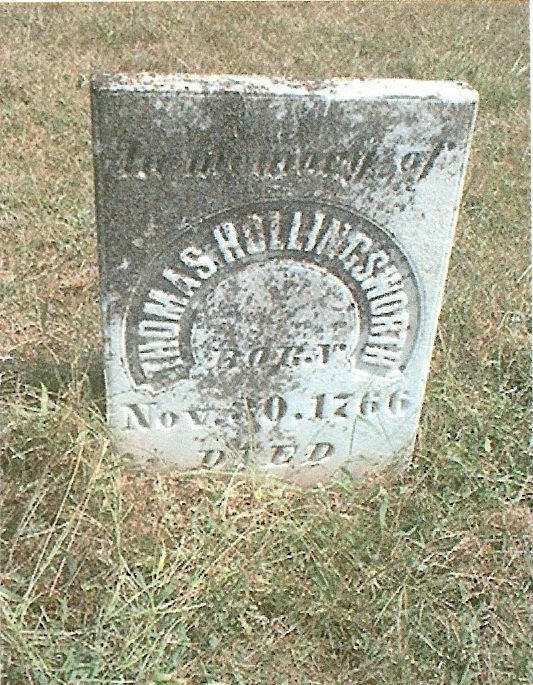 Thomas HOLLINGSWORTH "I" [Parents] was born on 30 Nov 1766 in Bush River Mm, Anson, North Carolina, [Now Union Co]. He died on 10 Oct 1841 in , Knox, Indiana. He was buried in 1841 in Price-Hollingsworth Cemetery. Knox, Indiana. Thomas married Mary Ann Price SARTOR on 17 Jul 1790 in , Union, South Carolina. Mary Ann Price SARTOR was born on 8 Sep 1769 in , Union, South Carolina. She died on 22 Dec 1841 in , Knox, Indiana. She was buried in 1841 in Price-Hollingsworth, Cemetery Knox Indiana. Mary married Thomas HOLLINGSWORTH "I" on 17 Jul 1790 in , Union, South Carolina. M i Bernard HOLLINGSWORTH was born on 22 May 1791. He died on 14 Feb 1876. F ii Nancy HOLLINGSWORTH was born on 23 Dec 1792. She died on 8 Dec 1860. M iv Abraham HOLLINGSWORTH was born on 16 Aug 1797. He died on 18 Dec 1872. F v Hannah HOLLINGSWORTH was born on 20 Oct 1799. She died in Jul 1835. F vii Elizabeth or Zilelia "Sibby" HOLLINGSWORTH was born on 13 Dec 1803. She died on 26 Mar 1878. M viii Thomas HOLLINGSWORTH "II" was born on 2 Apr 1806. He died on 2 Sep 1836. M ix Ferdinand HOLLINGSWORTH was born on 24 May 1808. He died on 26 May 1879. F x Sarah "Sally" HOLLINGSWORTH was born on 27 Feb 1810. She died on 30 Oct 1872. Noah E. PURCELL "Sr [Parents] was born on 20 Dec 1807 in , Knox, Indiana. He died on 6 Jun 1861 in , Knox, Indiana. Noah married Mary "Polly" LANE on 13 Dec 1842 in , Knox, Indiana. Mary "Polly" LANE [Parents] was born in 1816 in , Knox, Indiana. She died on 21 Aug 1851 in , Knox, Indiana. Mary married Noah E. PURCELL "Sr on 13 Dec 1842 in , Knox, Indiana. Eliza Ann PURCELL was born on 5 Apr 1843 in , Knox, Indiana. She died on 21 Apr 1860 in , Knox, Indiana. She was buried in West Salem Cemetery, , Knox, Indiana. May PURCELL was born about 1847 in , Knox, Indiana. Daniel PURCELL was born on 11 Jan 1849 in , Knox, Indiana. He died on 25 Dec 1865 in , Knox, Indiana. He was buried in West Salem Cemetery, , Knox, Indiana. Noah E. PURCELL "Sr [Parents] was born on 20 Dec 1807 in , Knox, Indiana. He died on 6 Jun 1861 in , Knox, Indiana. Noah married Ann MAYALL on 19 Feb 1863 in , Knox, Indiana. Ann MAYALL was born on 3 May 1843 in , , Kentucky. She died on 16 Dec 1913 in Johnson Twp, Knox, Indiana. Ann married Noah E. PURCELL "Sr on 19 Feb 1863 in , Knox, Indiana. John D. PURCELL was born in 1861 in , Knox, Indiana. He died on 21 Mar 1861 in , Knox, Indiana. He was buried in West Salem Cemetery, , Knox, Indiana. Ellis G. PURCELL was born on 7 Jul 1865 in , Knox, Indiana. He died on 10 Feb 1910 in , Knox, Indiana. Noah E. PURCELL was born on 30 May 1868 in , Knox, Indiana. He died on 3 Sep 1872 in , Knox, Indiana. He was buried in West Salem Cemetery, , Knox, Indiana. Charles Earle FRAZIER [Parents] was born about 1940. Charles married Patsy Ann LOWERY in 1964 in Atmore, Escambia, Alabama. Patsy Ann LOWERY [Parents] was born on 21 Jul 1944 in Jackson, Clarke, Alabama. Patsy married Charles Earle FRAZIER in 1964 in Atmore, Escambia, Alabama. Darren Scott FRAZIER was born on 1 May 1965. F ii Kimberly Ann FRAZIER was born on 2 Sep 1969. Charles Christopher FRAZIER was born on 4 Apr 1976. Daniel LANE was born on 12 Jan 1810 in , Knox, Indiana. He died on 6 Apr 1876 in , Knox, Indiana. He was buried in West Salem Cemetery, Knox, Indiana. Daniel married Sarah PURCELL on 16 Feb 1829 in , Knox, Indiana. Sarah PURCELL [Parents] was born on 10 Nov 1809 in , Knox, Indiana. She died on 15 Mar 1887 in , Knox, Indiana. She was buried in West Salem Cemetery, Knox, Indiana. Sarah married Daniel LANE on 16 Feb 1829 in , Knox, Indiana. John LANE was born on 18 Dec 1829 in , Knox, Indiana. He died on 10 Sep 1850 in Johnson Twp, Knox, Indiana. Caroline LANE was born about 1831 in , Knox, Indiana. She died on 7 Dec 1854 in , Knox, Indiana. Samuel P. LANE was born about 1833. He died after 1894 in , , California. Emaline LANE was born about 1834 in , Knox, Indiana. She died on 29 Mar 1856. M v William Purcell LANE was born on 8 Feb 1836. He died on 14 Mar 1894. Noah P. LANE was born on 20 Sep 1838 in , Knox, Indiana. He died on 25 Jan 1866 in , Knox, Indiana. Andrew P. LANE was born about 1841 in , Knox, Indiana. He died on 14 Dec 1874 in Johnson Twp, Knox, Indiana. Hannah E. LANE was born in Nov 1844 in , Knox, Indiana. She died in Feb 1847 in Johnson Twp, Knox, Indiana. Frances LANE was born in Jan 1846 in , Knox, Indiana. She died in Nov 1847 in Johnson Twp, Knox, Indiana. Eliza J. LANE was born about 1849 in , Knox, Indiana. William PURCELL [Parents] was born on 2 Sep 1811 in , Knox, Indiana. He died on 1 Jul 1850 in , Knox, Indiana. William married Sophie Jane BECKES on 2 Sep 1840 in , Knox, Indiana. Sophie Jane BECKES [Parents] was born on 1 Feb 1817 in , Knox, Indiana. She died on 20 Jan 1892 in Vincennes, Knox, Indiana. She was buried in Greenlawn Mem, Park, Vincennes, Knox Indiana. Sophie married William PURCELL on 2 Sep 1840 in , Knox, Indiana. John PURCELL was born about 1841 in , , Indiana. F ii Hannah Moore PURCELL was born in 1844. She died in 1913. M iii William Beckes PURCELL was born in 1846. He died in 1935. M iv Royal Ellis PURCELL "Sr" was born on 26 Jun 1849. He died on 7 Aug 1918. Peter KIMMONS was born in May 1813. He died on 14 Jul 1870 in , Knox, Indiana. He was buried in West Salem Cem, Knox, Indiana. Peter married Eliza PURCELL on 20 Nov 1839 in , Knox, Indiana. Eliza PURCELL [Parents] was born on 2 Nov 1813 in , Knox, Indiana. She died on 3 Aug 1890 in , Knox, Indiana. She was buried in 1890 in West Salem Cemetery, , Knox, Indiana. Eliza married Peter KIMMONS on 20 Nov 1839 in , Knox, Indiana. William Purcell LANE [Parents] was born on 8 Feb 1836 in , Knox, Indiana. He died on 14 Mar 1894. William married Catherine E. KIMMONS on 1 Jan 1857 in West Salem Church, Knox, Indiana. Catherine E. KIMMONS. Catherine married William Purcell LANE on 1 Jan 1857 in West Salem Church, Knox, Indiana. Royal Ellis PURCELL "Sr" [Parents] was born on 26 Jun 1849 in , Knox, Indiana. He died on 7 Aug 1918 in Vincennes, Knox, Indiana. He was buried in 1918 in Greenlawn Mem, Park, Vincennes, Knox Indiana. Royal married Mary Irwin PIDGEON about 1879 in , , Indiana. Mary Irwin PIDGEON was born in 1850. She died in 1880 in , Knox, Indiana. Mary married Royal Ellis PURCELL "Sr" about 1879 in , , Indiana. Royal Ellis PURCELL "Sr" [Parents] was born on 26 Jun 1849 in , Knox, Indiana. He died on 7 Aug 1918 in Vincennes, Knox, Indiana. He was buried in 1918 in Greenlawn Mem, Park, Vincennes, Knox Indiana. Royal married Georgia WISE on 15 Dec 1886. Georgia WISE was born on 25 Mar 1865 in , Knox, Indiana. She died on 17 Mar 1929 in Vincennes, Knox, Indiana. She was buried in 1929 in Greenlawn Memorial Park, Vincennes, Knox Indiana. Georgia married Royal Ellis PURCELL "Sr" on 15 Dec 1886. Royal Ellis PURCELL "Jr" was born on 27 Oct 1887 in , Knox, Indiana. He died in 1926. M ii George William PURCELL "Sr" was born on 6 Dec 1888. He died on 21 Oct 1952.